Welcome back to another Watercooler Wednesday Challenge! Well, I immediately knew that I would be using our new Copper Embossing Powder, as I had forgotten to add our new Copper Metallic Foil to my last order! (facepalm). Isn’t it amazing how the copper pops, whether it’s on black or white? I really expected it would be more subdued on the white, but wow! To work in the black & white combination, I decided to start with a Basic Black cardstock base, then have a panel of Whisper White, with a split panel of Basic Black again, on top. 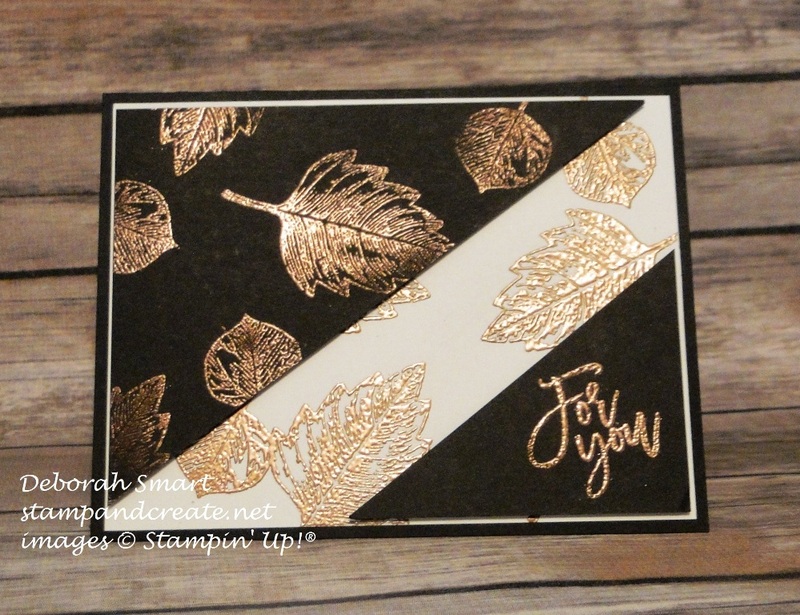 On both the white and black, I stamped the 2 kinds of leaves from the Vintage Leaves stamp set in Versamark ink, covered them with Copper Embossing Powder, and heat set it with my Heat Tool. I repeated the same steps with the sentiment, which I took from the Thoughtful Branches stamp set. I really like the script used in that set! I made sure to do one piece at a time, to make sure that the Versamark stayed wet enough to grab the embossing powder. The copper is definitely an ‘on trend’ colour this season; you can see it everywhere, from clothing and accessories, to home decor items. Stampin’ Up! is always on trend with colours, that’s for sure. I hope you’ll head over to the Watercooler Challenge blog, and see what the rest of the Watercooler Artists have designed for your inspiration. Then be sure to link up your own card for the challenge! I can’t wait to see what you design! This card is gorgeous, Deborah!. The copper makes it look so elegant! Deb what a fantastic card! I love how you’ve brought the embossing to both of the neutrals on your card, and they each look spectacular. Thanks for sharing!